Topics: Current Customer Info, Apply For Credit, Make A Payment, Reviews, and All Inventory. 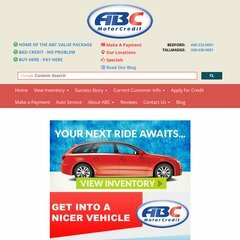 abcmotorcredit.com Ohio Buy Here PayHere Used Car Dealer - We Financed Consumer With ..
abcmotorcredit.com Compare JD Byrider Used Cars Sales in Ohio | Buy here Pay Here ..
42 users visit the site each day, each viewing 4.00 pages. Hostmysite (Delaware, Newark) is the location of the Microsoft-IIS/7 server. The programming language environment is ASP.NET. Its 2 nameservers are sand.ar51.net, and ruby.metisentry.net. PING (76.12.149.90) 56(84) bytes of data. A time of 85.5 ms, is recorded in a ping test.